Age-related Macular Degeneration (AMD) is an eye disease that affects the macula. The macula is a part of the retina. 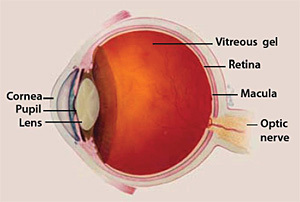 The retina sends light from the eye to the brain, and the macula allows the person to see the fine detail of the image. AMD blurs the sharp central vision needed for straight-ahead activities such as reading, sewing, and driving. There are two forms of AMD: dry macular degeneration and wet macular degeneration. A team of University of California, Berkeley, scientists in collaboration with researchers at the University of Munich and University of Washington in Seattle has discovered a chemical that temporarily restores some vision to blind mice, and is working on an improved compound that may someday allow people with degenerative blindness to see again. The chemical, called AAQ, acts by making the remaining, normally "blind" cells in the retina sensitive to light, said lead researcher Richard Kramer, UC Berkeley professor of molecular and cell biology. AAQ is a photoswitch that binds to protein ion channels on the surface of retinal cells. When switched on by light, AAQ alters the flow of ions through the channels and activates these neurons much the way rods and cones are activated by light. "This is similar to the way local anesthetics work: they embed themselves in ion channels and stick around for a long time, so that you stay numb for a long time," Kramer said. "Our molecule is different in that it's light sensitive, so you can turn it on and off and turn on or off neural activity." Because the chemical eventually wears off, it may offer a safer alternative to other experimental approaches for restoring sight, such as gene or stem cell therapies, which permanently change the retina. It is also less invasive than implanting light-sensitive chips in the eye. "This is a major advance in the field of vision restoration," said co-author Dr. Russell Van Gelder, an ophthalmologist and chair of the Department of Ophthalmology at the University of Washington, Seattle. "The photoswitch approach offers real hope to patients with retinal degeneration," Van Gelder said. "We still need to show that these compounds are safe and will work in people the way they work in mice, but these results demonstrate that this class of compound restores light sensitivity to retinas blind from genetic disease." The current technologies being evaluated for restoring sight to people whose rods and cones have died include injection of stem cells to regenerate the rods and cones; "optogenetics," that is, gene therapy to insert a photoreceptor gene into blind neurons to make them sensitive to light; and installation of electronic prosthetic devices, such as a small light-sensitive retinal chip with electrodes that stimulate blind neurons. Several dozen people already have retinal implants and have had rudimentary, low vision restored, Kramer said. "This is what we are really excited about," he said.